There's also a new rear spoiler for high-speed stability. Drink tube to keep you hydrated. 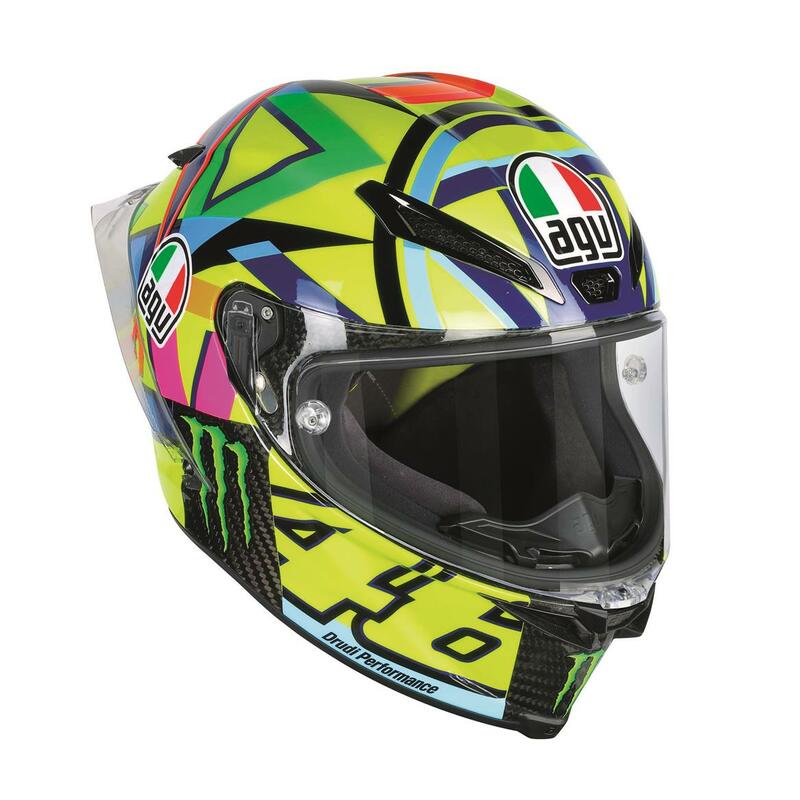 MotoGP levels of protection will come closer to the normal rider’s head next year with AGV’s introduction of the new 2017 Pista GP R.
It’s a massive revamp of the lid Valentino Rossi has been wearing since 2013, to improve aerodynamic performance at high speed and boost rider comfort, as well as cutting weight with a new lining. 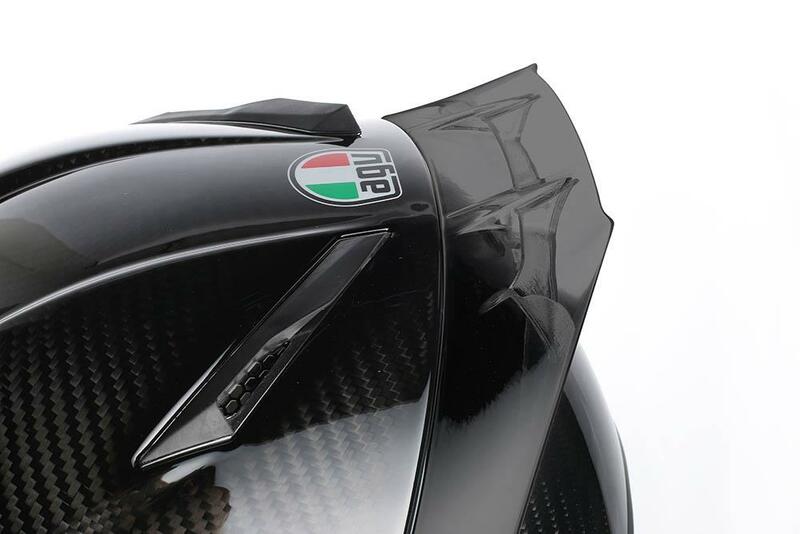 The outer shell remains the same as AGV felt there was little improvement to make on something that is already built from pre-preg carbon-fibre. This ensures it’s the lightest it can be while retaining consistent build quality to ensure rider safety. 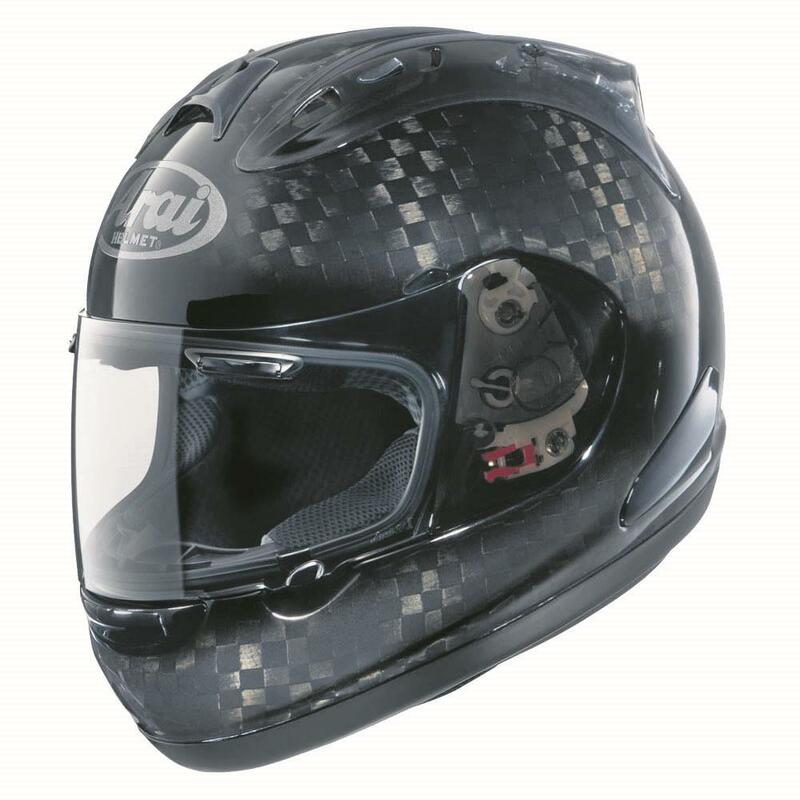 The most eye-catching development is the new drinks tube that’s incorporated into the helmet, with a bite piece fitted to the inner surface of the chinbar. The tube and connector that lead to a reservoir in the rider’s suit remain fitted to the helmet, although the bite piece can be removed. The other headline development is the new twin rear spoiler, which is there to deliver the claimed improvement in high- speed aerodynamics. The vents remain similar to the previous Pista GP, but the metal trims this time have ‘scoops’ permanently bonded to them – the idea behind this is to force a greater volume of air into the open vents. As on the outgoing Pista, the vents don’t have sliding covers like normal road helmets. 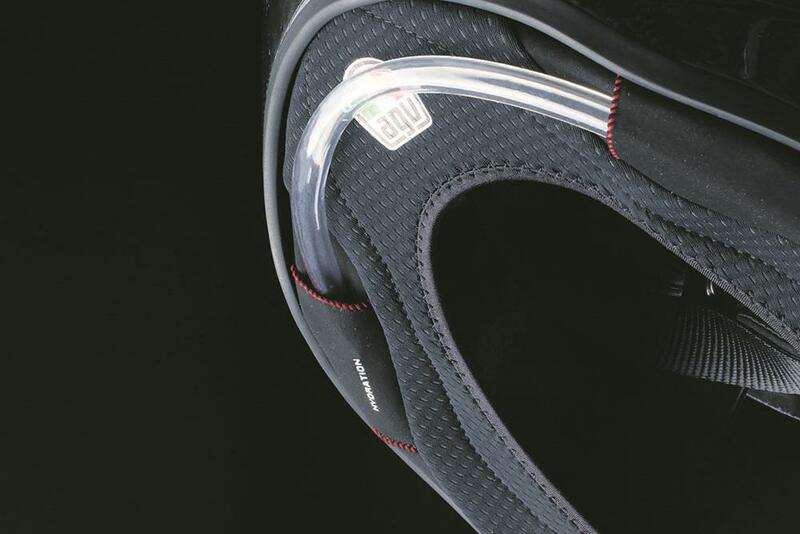 The Pista GP R comes with separate bungs that secure in place to block the vents for wet riding conditions. The visor is new and is now a whopping 5mm thick, while somehow still remaining in the Class One optical clarity category. It also uses a Pinlock Max Vision insert to eliminate fogging, though this one is the top- spec Pinlock 120 for even better protection than the regular Pinlock 70. The £999 price is for the Sole Luna design as worn by Rossi in this season’s MotoGP campaign. Two plain carbon-fibre designs will also be available for less money, though the price on those has yet to be confirmed. The new helmets will be available in the UK from next spring. With 11 hand-laid layers of F1-spec carbon- fibre, the only helmet with greater exclusivity than the Pista GP R is this £2499 limited edition Arai. It’s a complete work of art! There's also a new rear spoiler for high-speed stability. Drink tube to keep you hydrated.